and Kapha doshas, the Ayurvedic governing principles in the mind-body. that all six tastes should be included in every meal—or at least once every twenty-four hours to create a balanced diet. Special Ayurvedic teas and seasonings have been developed to assist in creating balance in Vata, Pitta and Kapha. The chart below is designed to help make it easy at a glance to know what the six Ayurvedic tastes do. 2. Eat Organic or Locally Grown Foods Whenever Possible. Locally grown foods are also higher in prana, because they don't have to be shipped or stored and can be bought tree-ripened. There is another reason to eat locally grown foods--they contain the same ratio of the five fundamental levels as the climate in which you live. One ayurvedic principle says that equal proportions of the elements is always enhancing. Locally grown herbs, fruits, vegetables and dairy products will have a more powerful and energizing biological impact. Herbs and plants grown in the desert are more helpful for the people who live in that kind of dry, hot climate. This principle doesn't apply to grains or beans, which are grown in different regions. And if you can't get locally grown veggies or fruits, it's better to eat imported produce. The point here is that if you have a choice, buy or grow local produce for more vitality. Besides fresh, organic fruits and vegetables, an energizing diet includes whole grains such as quinoa, barley and amaranth. For protein, organic milk, lassi (a yogurt drink), panir and (fresh cheese) are energy-producing. Almonds, cashews, or walnuts are an excellent source of protein if they are soaked first or cooked with the grains to make them more digestible. Split-mung dhal and other small or split beans are an excellent source of protein. 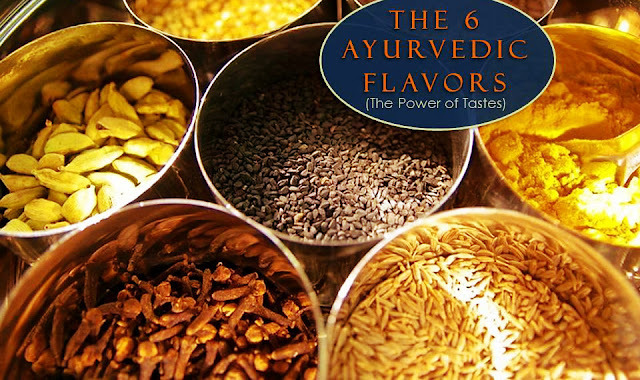 Ayurveda recommends that you eat all six flavors--sweet, sour, salty, bitter, astringent and pungent--in every meal. If you are getting bored with your food, or if you are having cravings for unhealthy foods, that's a clue that you are not getting all six tastes. Avoid foods that don't digest well when combined, called mutually contradictory foods . According to AYURVEDA combining the following foods create ama and low energy. · Milk and salty, sour, bitter, pungent or astringent tastes. The only taste that combines well with milk is some foods from the sweet taste, such as sugar, dates, honey, rice or wheat. For this reason, it's better to drink milk separately from your meals. · Ghee and honey (when mixed in equal parts). Drinking lots of coffee, tea or caffeinated soft drinks may give you a false burst of energy, but caffeine taxes the liver, creating a toxic build-up and fatigue. It's better to drink beverages that clear toxins from the channels of the body, allowing the free flow of prana to revitalize the brain and organs. Almond Energy,Raja's Cup, and Vata, Pitta and Kapha Teas are energizing beverages to choose from. If you must eat out, choose your restaurant carefully. Keep an eye on the ingredients and cooking methods. Are the ingredients fresh or frozen? Are leftovers served? Are there healthy oils? These are the questions you can ask. Ayurveda recommends that you eat in a settled atmosphere to gain maximum vitality from food. If you talk on the phone, watch TV or conduct a business meeting over lunch, your food is not going to digest properly. It will probably create ama, which is the cause of dullness and fatigue. Eating while standing, walking or driving also creates ama rather than energy. Turn off the electronic devices and eat with someone you care about. Leave your responsibilities at the door--and instead revel in the beautiful colors, tastes, smells and textures of the food. All of this amounts to respecting your food and your digestion, and will help create the kind of light, clear, vital feeling that good food is meant to do. IN Maharishi Ayurveda,we offer you best Ayurvedic treatment which improving our life structure.Ayurvedic Treatment in India.These hospital has well maintained infrastructure with separate treatment rooms from males and females.IN Ayurvedic hospital,There are several types of therapies available.